The latest Roy Morgan poll reports a surge in support for National – up 8.5% to 54% – one of the highest rises since October 2011, according to Australian-based the polling company. Undecideds were up one percentage-point to 5%. However, the results should be seen in the context that the poll was conducted in the lead up to, and during, the 2015 Budget, delivered on 21 May. 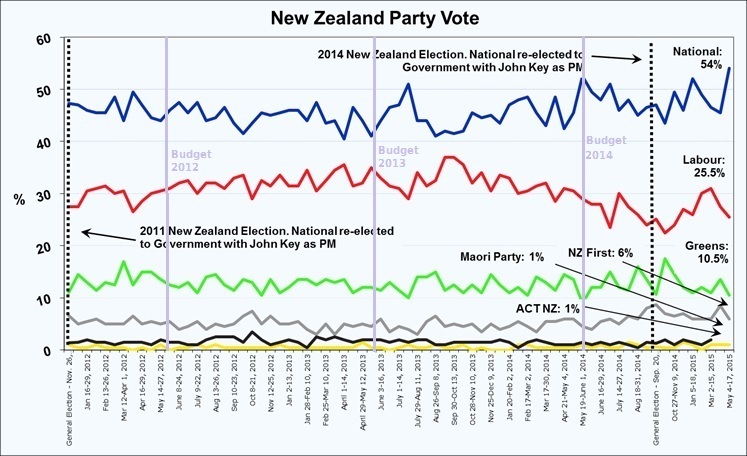 The ‘spike’ in National’s support will begin to abate, as on previous occassions. As housing prices continue to escalate, and child poverty continues to be a major problem in our society, the public will once again focus on what – if anything – National is doing to alleviate them. On top of which will be a growing feeling that if English fails to deliver a Budget surplus next year, then National’s talk of tax cuts becomes more and more an absurdity. This seems more than likely according to various commentators, as next year’s surplus has already been pared back from $565 million to $176 million. National got away with promises of tax cuts in 2008, even as the Global Financial Crisis was impacting on our economy. But at that stage, the Great Recession had not yet hit with full force. Unemployment in 2008 was still only 4.3% and the Clark-led Labour government had paid down most of the country’s sovereign debt. Faced with the Four Horsemen of the Fiscal Apocalyspse of another Budget deficit; higher debt; broken promise of tax cuts; and a runaway housing crisis in Auckland – National’s undeserved reputation as a “prudent manager of the economy” begins to look every bit as shabby as what Muldoon left the country. 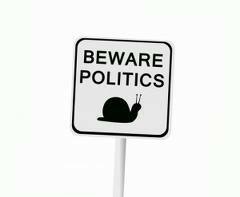 By 2017, even a Budget event may not be sufficient to give National a boost in the polls. This blogpost was first published on The Daily Blog on 26 May 2015. 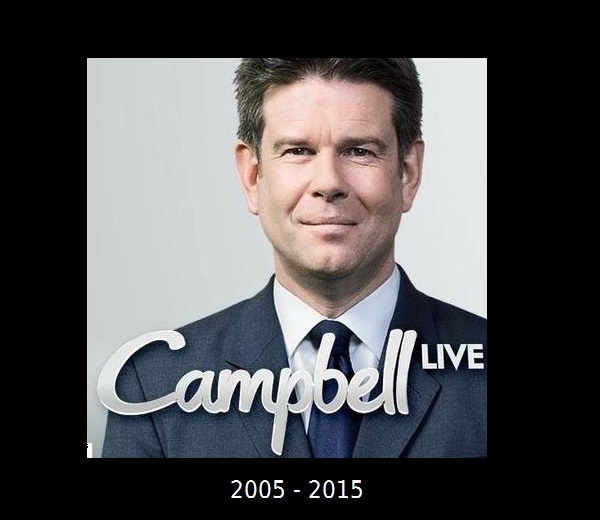 ‘Campbell Live‘ was more than just current affairs. It was more than just a vehicle for advertising. It was the heart and soul of the nation, and epitomised those values which we Kiwis profess to hold dear; fairness, tolerance, and giving others a fair go. 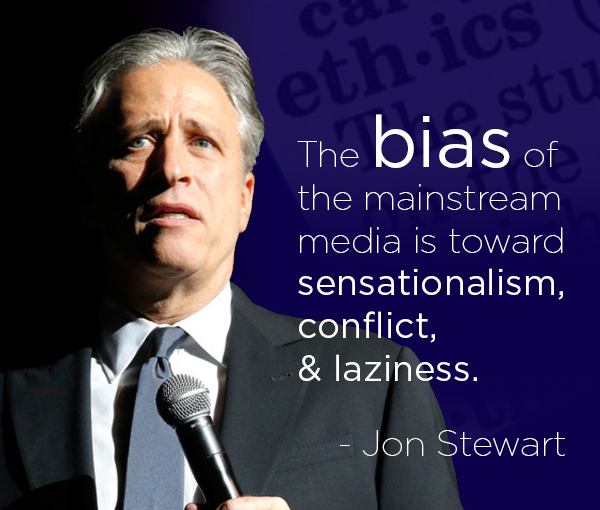 Perhaps in this day and age of bottom-lines; stakeholders; shareholders; mission statements; unbridled consumerism; value-for-money; and all the other faddish buzz-words of this Corporate Age – a show like ‘Campbell Live‘ was an anachronism, reminding us of another New Zealand. 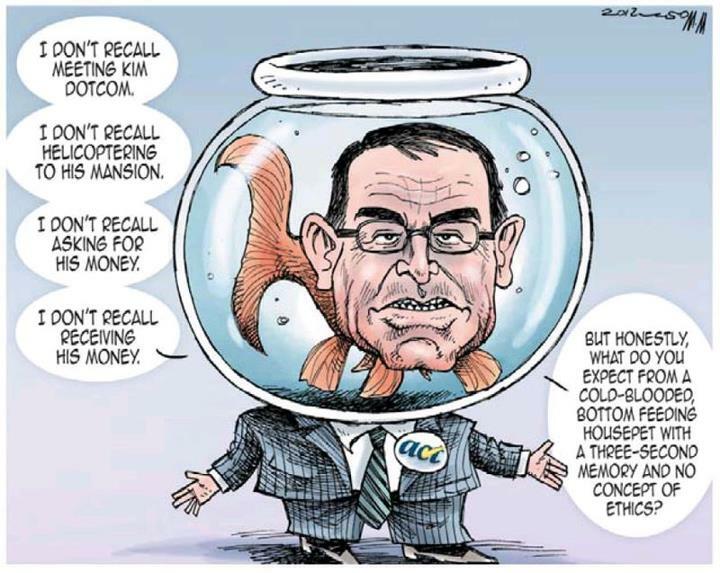 John Campbell and his hard-working team of professionals reminded us that we are better than just consumers chasing, en masse, the cheapest bargains. He reminded us that we are still citizens, and that we should still care about the country we live in. Today, we lost another small piece of what it means to be a Kiwi. Today, we lost a little more of our soul. Thank you, John and your team. And my apologies that we could not help you, as you’ve helped us, over the years. That is my deepest regret. This blogpost was also published on The Daily Blog on 29 May 2015. Whatever is slated to replace ‘Campbell Live‘, I care not one whit. Short of the second coming of Jesus Christ; time travellers from the future; the breakout of world peace, or some other vastly improbable event, our household will no longer be watching TV3 News and whatever follows. Mark Weldon and Mark Jennings have badly underestimated that public backlash that will follow this incomprehensible decision. ‘Campbell Live‘ is a decade-long brand that media companies spend millions in advertising to promote and instill in the public’s consciousness – and at a stroke they have destroyed it. Weldon was also appointed by Key, or one of his Ministers, the Capital Markets Development Taskforce in 2009/10; the Tax Working Group in 2009; and the Climate Change Leadership Forum in 2007. Key gave him a QSO in the 2012 Queen’s Birthday Honours List. Is it a conspiracy between the National government and Mediaworks? There is no evidence to prove such an allegation. National supporters will quickly dismiss any such suggestion with derision. If it ever was proven that National had a hand in Campbell’s sacking, would National’s apologists respond in the same way? You bet. MediaWorks’ subsidiary RadioWorks has repaid the $32.28 million outstanding on a “loan” signed off by former Communications Minister Steven Joyce that allowed the media group to defer payments to the Crown for radio spectrum licences. The balance of $32.28m of principal plus interest was paid on Wednesday – almost two years ahead of schedule, current minister Amy Adams said in a statement. MediaWorks had originally owed $43.3m plus GST and had previously made two payments of $11.9m. The Crown charged the private equity-owned company interest of 11.2 percent. Government officials had recommended against loaning RadioWorks the money, but Mr Joyce, a former owner of RadioWorks, then approved the loan. 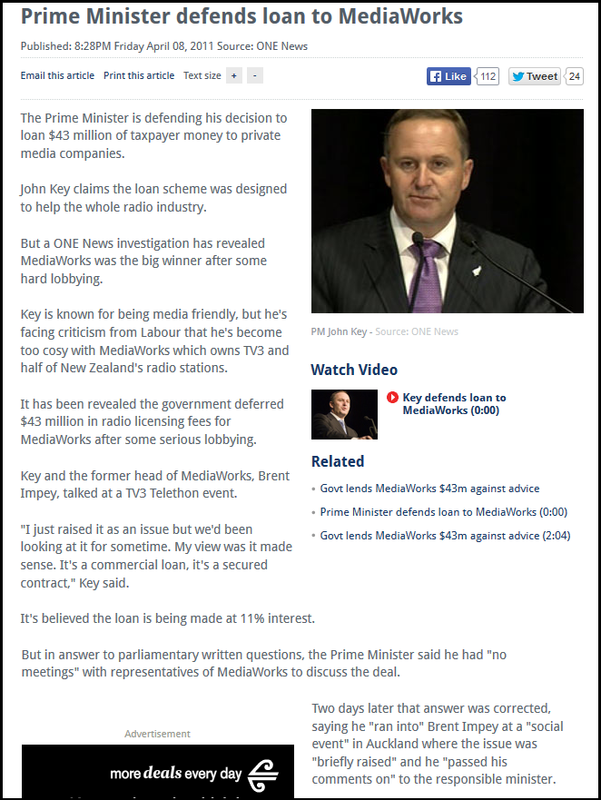 Note the reference in the media report above; “[Minister] Joyce, a former owner of RadioWorks, then approved the loan“. 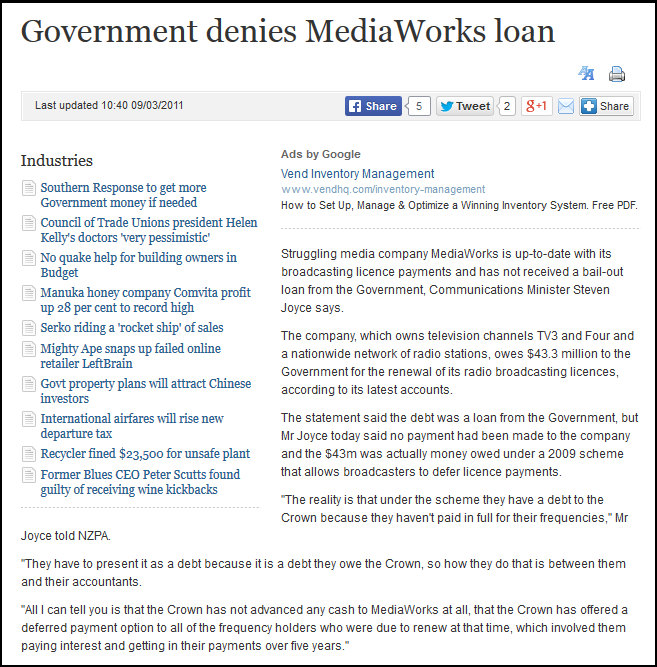 Joyce was indeed owner of RadioWorks, until it was bought out by CanWest, in April 2001. CanWest was also former owner of TV3. Earlier this week, a spokesman for the Prime Minister said Mr Key’s diary showed no scheduled meetings with Sky City representatives since July last year. Mr Key was asked last July in a question for written answer from Green MP Sue Kedgley whether he or any of his ministers had met representatives from the casino to discuss changes to the Gambling Act. He replied: “I attended a dinner with the Sky City board 4 November 2009 where we discussed a possible national convention centre and they raised issues relating to the Gambling Act 2003”. 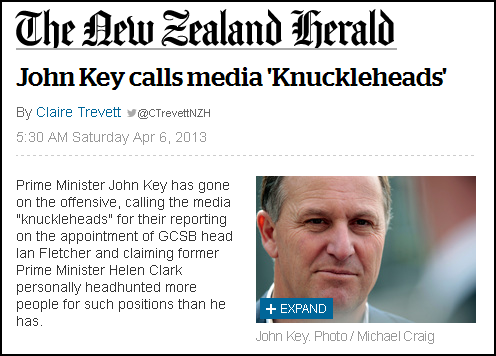 Mr Key said he was unable to speak for other ministers as to whether they had met casino representatives. 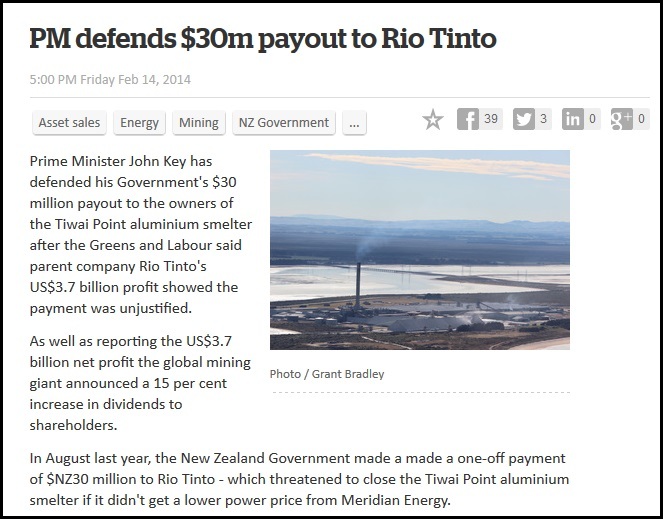 Mr Key’s spokesman today refused to say what date Mr Key’s offer to make a deal with Sky City was made. 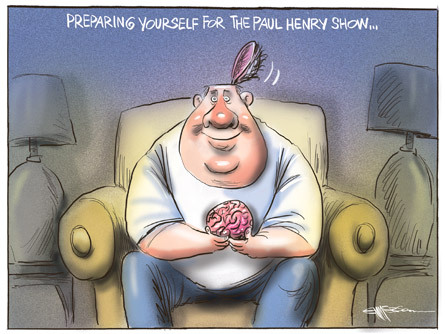 Mediaworks’ rationale for canning ‘Campbell Live‘ has rested solely on it’s supposed ratings. Campbell Live is to be replaced by a four-day-a-week programme presented by two people. Mr Jennings said audience research suggests that people want more stories at a shorter length, and TV3 had already been trying to get more stories into Campbell Live. Considering that ‘Campbell Live‘ already often presents three or four stories, of varying lengths, within it’s half-hour slot – even with advertising breaks removed! – it is hard to see how much shorter a story can get. Are we talking about four-minutes-once-over-lightly? Many issues and problems confronting our nation are deep and complex. It is hard to see how making a story shorter gives viewers the details necessary to inform and enlighten. In effect, it seems to be a continuing dumbing-down of the 7PM timeslot. Asked about criticism of the lack of promotion for the programme and Mr Campbell, Mr Jennings said Campbell Live was an established programme and he didn’t think that publicity campaigns would make much difference to the size of its audience. Really? And yet TV3 heavily promotes entertain shows like “The GC“; “X Factor“; “The Block“, and “The Bachelor” – programmes that are high in entertainment (questionable) but lacking in any informative value whatsoever. Like consuming a constant diet of sugar and carbs, but nothing else of a substantive, nutritional nature. 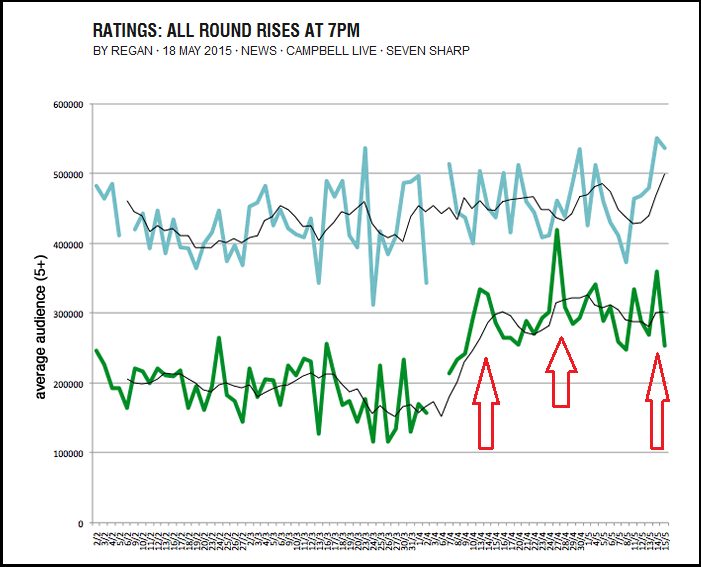 Note the highs where ‘Campbell Live‘ (in green graph) outperforms ‘Seven Sharp‘ (though not often in the same evening) and note how viewing numbers are steadily increasing for ‘Campbell Live‘ but remain relatively static for ‘Seven Sharp‘. For ‘Campbell Live‘, the numbers are moving in the right direction. If ratings are the sole determinant of what goes/stays, then TV3’s News at 6PM should be the first to face the chop. At 220,930 viewers, it 109,900 behind ‘Campbell Live‘. Even ‘Jono and Ben did better, with 3,280 more viewers. Interestingly, TV3 gains viewers after it’s 6PM News. TV1 loses 270,710 viewers after their 6PM News. The upshot of this should be blatantly obvious to the dullest TV executive (take note please, Mark Weldon); Mediaworks has hot property in the form of ‘Campbell Live‘. ‘Seven Sharp’ – not doing quite so well in viewer retention. ‘Campbell Live‘ should be promoted by Mediaworks – not dumped and replaced by some lowly imitation of TV1’s execrable ‘Seven Sharp’ . Has Mediaworks actually taken the time and effort to conduct a focus group on how ‘Campbell Live‘ is perceived? This is important because one of the most important commercial factors in a product or service is branding. If ‘Campbell Live‘ has a more positive branding than, say, ‘Seven Sharp‘, then Mediaworks is being foolish and short-sighted in not capitalising on it. If whatever replaces ‘Campbell Live‘ fails to attract numbers, then those responsible should – and must – fall on their corporate swords and resign. If the leaders of Labour and ACT could take responsibility for their parties dismal results at the last election, then so should the entire Board of Mediaworks, starting with Mark Weldon. Companies expect hard work and dedication from their employees, and fair enough. But to then shaft employees who have given that hard work and dedication, and put their heart and soul into their profession – is a poor reward. For those executives at Mediaworks who made the decision to axe ‘Campbell Live‘, I have a clear and simple message for them. They may expect the same loyalty from viewers toward TV3, as they themselves have shown to John Campbell, his team, sponsors, advertisers, audience, and loyal fans. I look forward to repaying in kind. From everyone on Campbell Live, your support and kindness has saved us during these past seven weeks. Not only did it lift us personally, it reminded us why we’re here and that what we do matters and can make a difference. To the 86,000 people who so kindly signed the petition, and even marched for us, thank you – very much. We’re so proud to have you as viewers. Pip Keane, John Campbell, Ali Ikram, Anna Burns Francis, Sarah Stewart, Tory Evans, Chris Jones, Jayne Devine, Julian Lee, Lachlan Forsyth, Marise Hurley, Michael Hardcastle, Mike Wesley-Smith, Sarah Rowan, Claire Eastham-Farrelly, Tristram Clayton, Vanessa Forrest, Billy Weepu, Dan Parker, Whena Owen, Lee Thomson, Emily Samonta, Jendy Harper, John Sellwood, Kate McCallum, Graeme Mulholland. How many of us felt the same? For many of us, John Campbell was like the Conscience of the Nation; the person we could most trust to tell a story that held authority to account; truth to power; and spoke for the ‘ordinary Kiwi battler’. Someone in mainstream media recently asked me, in a roundabout way, if we would feel the same if Mike Hosking left NewstalkZB. Hosking does not engender the same empathy and respect that Campbell does. This blogpost was first published on The Daily Blog on 24 May 2015. Jennings’ responses to Colin Peacock are at times contradictory, and at others, raise more questions still. The listener is left wondering if there is indeed more to the demise of ‘Campbell Live‘ than Mediaworks has been letting on. 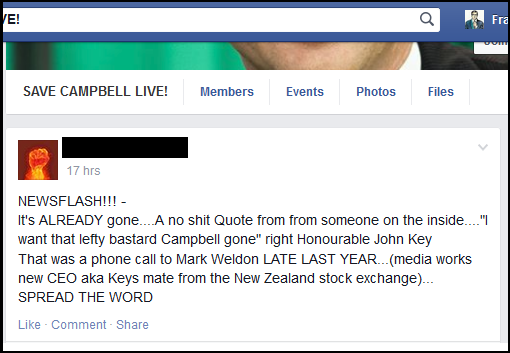 The number one question has to be why Mediaworks did not promote ‘Campbell Live‘ more heavily. Jennings’ comment that the show “had been drifting down in ratings” simply does not stack up when the rating numbers are looked at. Jennings admitted that the recent “burst of publicity has helped” ratings. So, one is left wondering why Mediaworks has not done it’s own promotional activity if the “burst of publicity” helped. Listen to the interview. Come to your own conclusion. This blogpost was first published on The Daily Blog on 25 May 2015. When it comes to tax cuts for the rich; state asset sales; slashing public services; and corporate welfare – National can move at relativistic velocities that Einstein concluded were beyond the realms of physical laws in our Universe. When it comes to social problems like child poverty; increasing greenhouse emissions from agriculture; and a housing crisis in Auckland (denied again, recently, by our esteemed Prime Minister) – the National government can tinker and prevaricate in ways that would do a two year old, at an early childhood centre, proud. 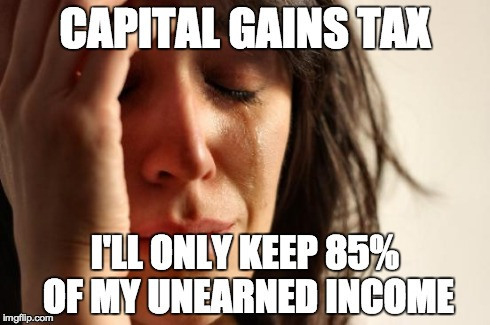 It has opposed, resisted, condemned, criticised, and generally done everything within it’s power not to implement any form of capital gains tax in this country. 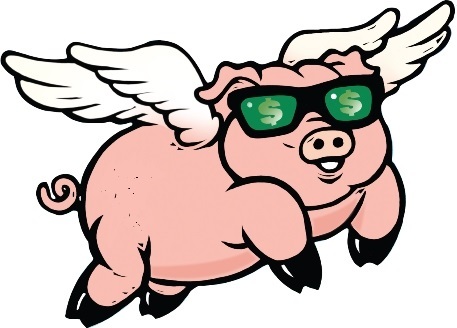 Suggesting to National that a CGT could be one tool (of many) to quell housing speculation in Auckland has been like inviting a Vegan to a spit-roast barbecue. Belatedly, as is usual for this government, after considerable pressure from multiple political, community, business, and state sectors, Key has decided to move – albeit at a glacial pace, and with a tentative single step – to introduce a limited Capital Gains Tax. Introducing a new bright line test to tax gains from residential property sold within two years of purchase, unless it’s the sellers main home, inherited or transferred in a relationship property settlement. But – two years is the “bright line”?! So, property speculators/investors who sell their assets in, oh, say, two years and one day are safe? I’m sure this has escaped the attention of every property speculator/investor in the country. Plus their accountants. Plus tax specialists. Plus the chap who mows the lawns. Shhhh! Be vewy, vewy quiet! Don’t tell anyone. Tinkering – best left to a National government. They are expert at it. Why should tradies be prosecuted for doing “cashies” and not paying tax? Letter to the Editor – A Claytons Capital Gains Tax? This blogpost was first published on The Daily Blog on 21 May 2015. Banks fudged the question and repeated that he had been exonerated under the Electoral Act. Why did Kim Dotcom split his $50,000 donation into two lots of $25,000? Why was Kim Dotcom’s two donations recorded as “anonymous”, when the name “Megastuff” was clearly imprinted on his cheques? 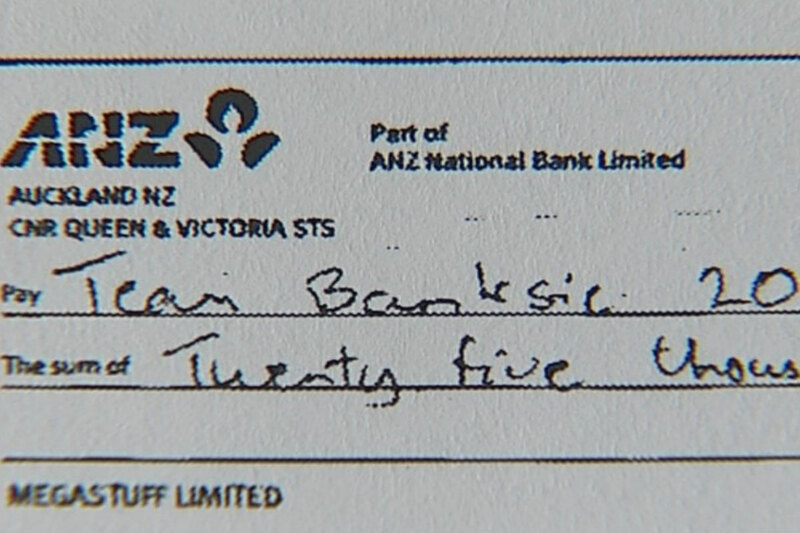 Who were the other three $25,000 anonymous cheques from? Were they all from one donor, splitting his/her $75,000 donation into three lots to avoid requirements to name benefactors? Plus, there are other matters of Banks “forgetting” that he had met Kim Dotcom; forgetting that he had asked for a donation; forgetting taking a helicopter ride to his Coatesville mansion, etc. No such thing has occurred. His case was dismissed on a technicality. The evidence – including any new evidence – was never put before a jury to determine. I submit to the reader that judicial “vindication” by technicality is no vindication at all. Banks’ claim to innocence should be regarded as a mere “technicality”, at best. 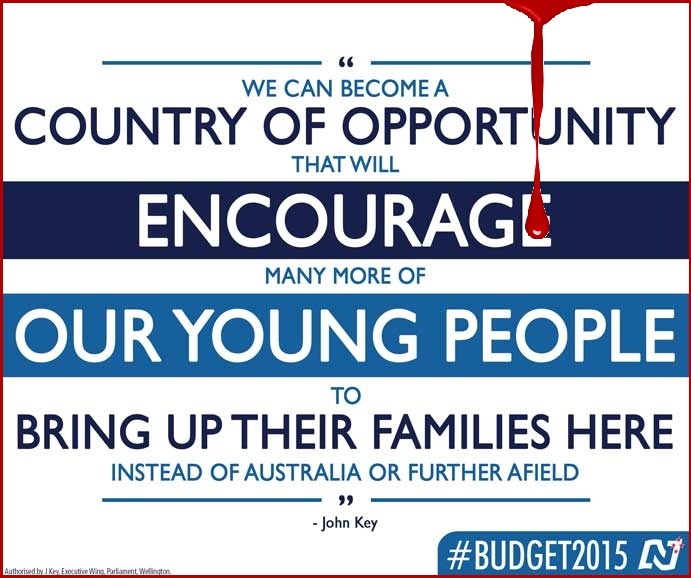 Prime Minister John Key is lowering expectations about measures to combat child poverty in this week’s budget. 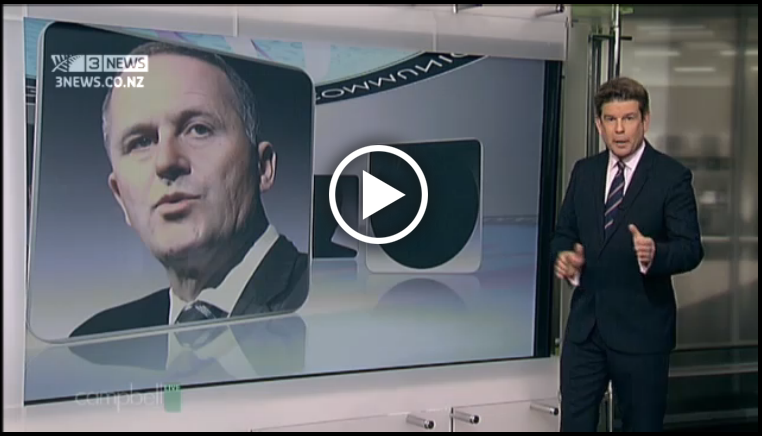 Mr Key says there’ll be “some support” for those suffering material deprivation. “But you’d appreciate that there’s a limited amount of resources that we’ve got in very tight financial conditions,” he told reporters on Monday. Of course National doesn’t “have a lot of money“. Remember the tax cuts that Key promised during the 2008 general election? That was the money National gave away in 2009 and 2010. 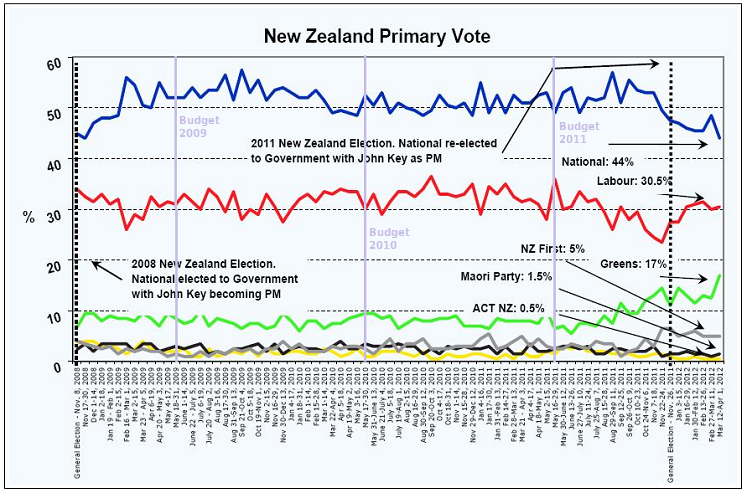 2008 was election year, and National’s aspiring leader, John Key, was pulling out all stops to win. His promises of tax cuts were the lynch-pin of National’s campaign strategy. The admission on borrowing comes as National faces growing calls to explain how it will pay for its promises, which include the larger faster tax cuts, a $1.5 billion broadband plan and a new prison in its first term. GDP shrank 0.2 per cent in the June quarter, confirming what everyone already knew – that the country is in recession. The smaller than expected June quarter decline followed a fall of 0.3 per cent in the three months to March, so the country now meets the common definition of recession: two consecutive quarters of economic contraction. 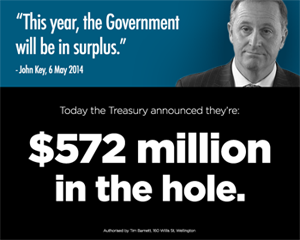 National will not slash spending at a time when people are looking to the government for a sense of security. In developing our economic management plan, we have concentrated on the fundamentals of the economy, and particularly on laying the foundations for a future increase in productivity. National’s rebalancing of the tax system is self-funding and requires no cuts to public services or additional borrowing. • Discontinuing the R&D tax credit. • Replacing Labour’s proposed tax cuts. Overall, our fiscal policy does not result in any requirement for additional borrowing over the medium term. National won the election on 8 November 2008. The New Zealand government’s operating balance before gains and losses (OBEGAL) for the seven months ended January 31 was NZ$600 million, which was NZ$800 million below the pre-election update and NZ$300 million below December forecasts, Treasury said. Tax revenue and receipts during the period were NZ$500 million lower than the pre-election forecast. Meanwhile, Treasury also disclosed a NZ$15.4 billion rise in Gross Sovereign Issued Debt to NZ$45.4 billion (25.3% of GDP) from the pre-election forecast. This included fresh Reserve Bank bill issuance to mop up the liquidity from lending to the banks against securitised mortgages. 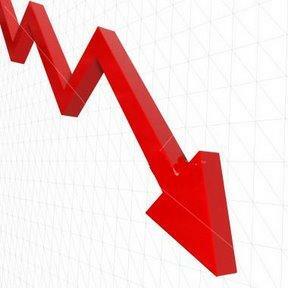 Despite falling tax revenue, and increased borrowing by the government, the tax cuts went ahead regardless. First, on 1 April 2009. The second trance on 1 October 2010. The cost of these tax cuts was in the billions. The Green Party has today revealed that the National Government has so far had to borrow an additional $2 billion dollars to fund their 2010 tax cut package for upper income earners. New information prepared for the Green Party by the Parliamentary Library show that the estimated lost tax revenues from National’s 2010 tax cut package are between $1.6–$2.2 billion. The lost revenue calculation includes company and personal income tax revenues offset by increases in GST. All up, National gave away an estimated $3 billion – per year – in tax cuts. That is why John Key has reneged on his promise – made on 22 September 2014, on TV3’s ‘Campbell Live‘ – that his third term would be spent combating child poverty. Not only will National abandon any serious work to alleviate growing child poverty in this Country of Plenty, but it seems that the viability of community organisations doing invaluable work are threatened by chronic under-funding. These community groups are often the ones on the front-line, picking up the pieces after government programmes are cut back or cancelled entirely. Even as our Brave New Free-Market World widens the wealth-gap even further, year after year. Since National came to office in 2008, their cuts to community organisations has been systematic and dire. 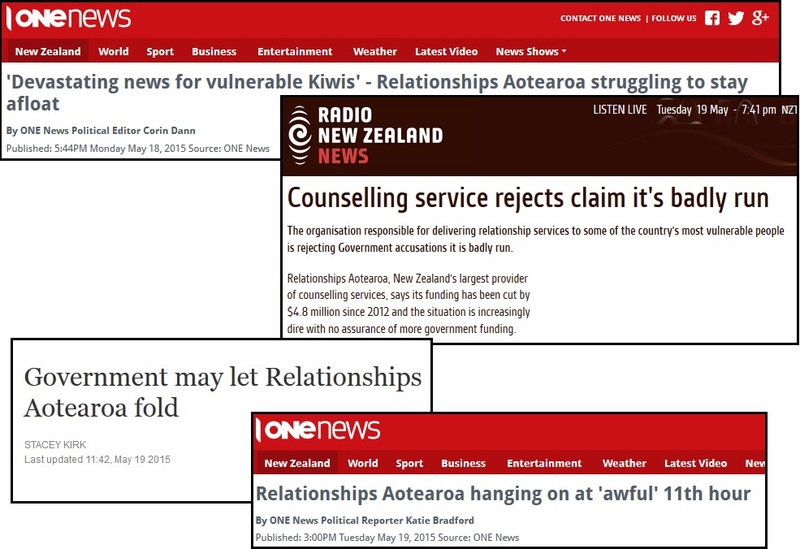 Relationships Aotearoa, New Zealand’s largest provider of counselling services, says its funding has been cut by $4.8 million since 2012 and the situation is increasingly dire with no assurance of more government funding. The organisation posted a $271,000 deficit for the year ended 30 June 2014. 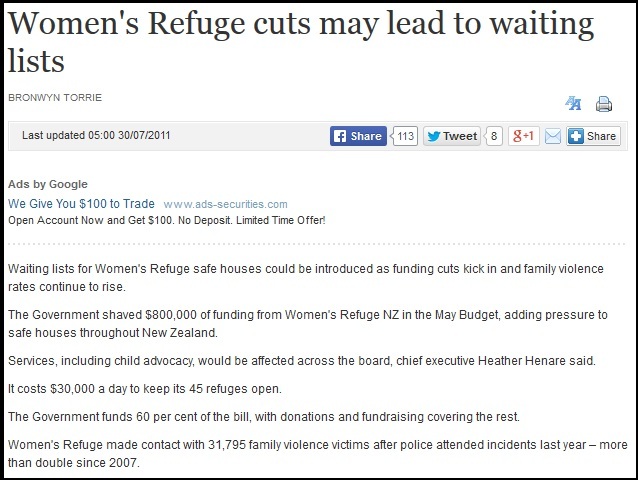 Relationships Aotearoa spokesman John Hamilton said since 2012 its funding from government agency contracts had fallen by $4.8 million – a fall of about 37 percent from $13.1m to a forecast $8.2m. Mr Hamilton said the situation was increasingly dire and more than 120 staff and 60 contractors would potentially lose their jobs if went goes under. Tolley’s exercise in word-games beggars belief and if she thinks any intelligent person listening to her comments gave credence to her obvious avoidance-tactics, then she is delusional. There is a world of difference between Radio NZ’s critical audience – and those who stare stupified and lobotimised at ‘X Factor‘/’My Kitchen Rules‘/’The Block‘. 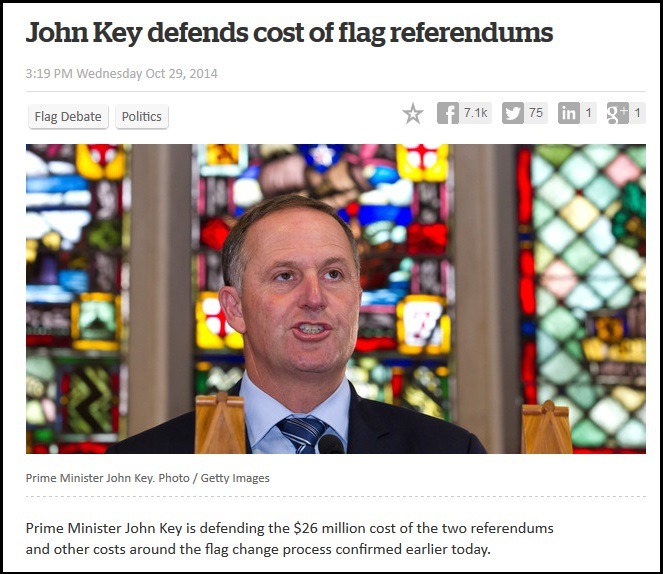 Though there is always cash for really important things that “matter to New Zealanders”. Key will always find money for things that matter to his government. Child poverty just doesn’t happen to be one of them. This blogpost was first published on The Daily Blog on 20 May 2015.